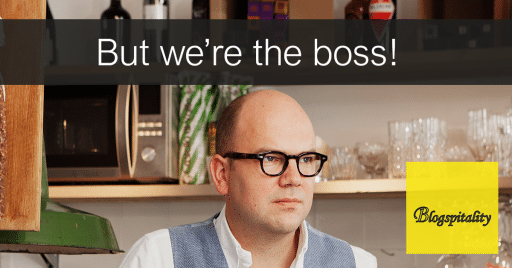 Home » Blogs » Customer is King… But we’re the boss! Indeed, we still know, good talking to you, Simon. After your last visit to our restaurant I tried to call you a couple of times, unfortunately with no success. I also sent you a message, haven’t you read that? Well Simon, to tell you the truth, you did not leave anything behind, I was calling to tell you I do not appreciate you and your company visiting our restaurant again. We have received multiple complaints from other guests concerning that evening, and also, our staff addressed against the behaviour of the children and the volume at your table. Simon, it actually was that bad. Your children sincerely drove us mad. They didn’t listen to you, but they also didn’t listen to any of us. They were running through the restaurant, harassing other guests and acted if they were in a huge playground. It was life threatening and it was extremely noisy. Next to that, you had drunk way too much yourselves and were ranting about the most bizarre, abhorrent subjects in a preposterous volume, Simon. That was just not acceptable. I disagree with that statement, but you might think that. Another reason why you should not come back to our place. We have experienced a very bothering evening, so did the other guests. The only thing I sincerely regret is that I did not kick you out of the restaurant during that evening itself. I wanted to let you know myself, which is the reason for my messages. Sure Simon, whatever you like. I wish you a very pleasant day. This story was based on an event that occurred last month in Northern part of Holland. Of course, the name of Simon Verankeren is not the name of the concerned guest. Perhaps you spot the review of this situation somewhere, at least you know the other side of the story!